Jeep tires come in variety sizes from several different manufacturers. 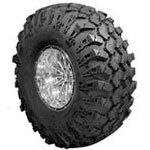 There are mud terrains, all terrains, and even specific rock crawling tires. Choosing the right tire for the type of terrain you drive on regularly is essential...Hint: if you drive primarily on the highway, you probably want to skip the boggers...m'kay.